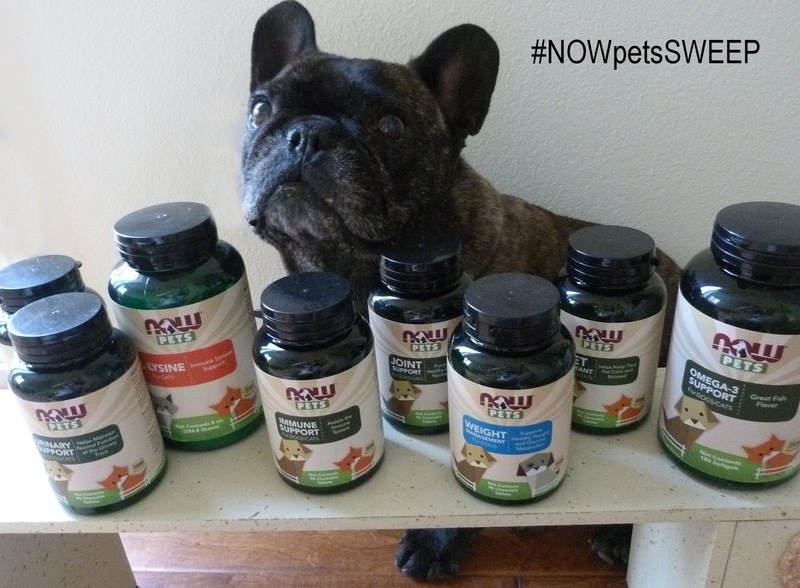 This post is sponsored by NOW® Pets Supplements and the BlogPaws® Pet Influencer Network™. 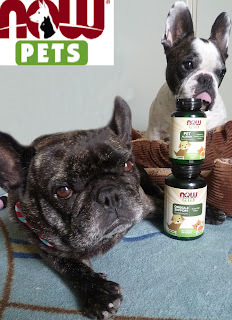 I am being compensated to help share information about NOW® Pets Supplements products and their giveaway, but Two French Bulldogs only share information we feel is relevant to our readers. NOW® Pets Supplements is not responsible for the content of this article. "NOW® Pets is a new line of quality pet supplements from NOW®, specifically formulated to support optimal health and wellness for dogs and cats. Formulated with the guidance of Dr. Barbara Royal, DVM, CVA, a renowned Midwestern veterinarian and pioneering expert in holistic animal care, the NOW® Pets line offers products specifically tailored to address today’s most common pet health concerns." We like the fact the company has been around since 1968 manufacturing health products and supplements for you! a natural relaxant for pets due to thunder boomers...fireworks, etc.. This is what I call one stop shopping with a high quality product. These peoples sent us 87 zillion natural supplements. The allergy support helps maintain normal histamine levels since I get itchies. NOW® Pets Joint Support: which helps alleviate occasional discomfort associated with routine daily activity. NOW® Pets G.I. Support: Aids in reducing occasional loose stools due to transport, boarding, or dietary changes to your pet’s daily routine, and helps with occasional gastric distress. I have had occasional issues with my belly since I was 11 weeks old. Mommy cooks my food which helps. However, adding the G.I. support one tablet twice daily works wonders when my belly issues occur. These are my three main concerns. I see there is one for Fatty Edward, BOL. Yes, there is a jar for me! Lily and mommy agree I may need this supplement to support normal weight management. UPDATE: I have used the Weight Management product and lost 2 pounds. No I am sexier than ever. "NOW® Pets has earned a quality seal from the National Animal Supplement Council (NASC), an organization that works together with the FDA and committed manufacturers of animal health supplements to improve the quality of animal health products." This is a sponsored conversation written by me on behalf of NOW Pets. The opinions and text are all mine. This sounds like a great line of supplements! I want to enter the contest but I got a Page Not Found error? I especially like the natural relaxant, Icy could sure use that, she's terrified of thunder and fireworks. Poor thing suffers so much. Ooh, do they have a supplement for kidney problems? Momma's always looking for more help for Jessie! We have a few NOW products in our pantry. They make awesome supplements! Wow just look at all those supplements, you two are going be soooo full of energy!!!! You are quite handsome! Congrats on the weightloss. You are beach ready. If they help your tummy, that's great! And Edward...handsome as ever! Roxy has started Joint medication.....just in case...because of her wonky leg. Thanks for telling us about those products - they sound like they would be very good for us. And Edward, we think you are just perfect the way you are. Great review and information! You are so thoughtful and helpful! Wow, they have something for everything! These sound terrific! We currently use some joint supplements but Pierre runs from them. LOL! We might have to try the NOW brand. Wowsers, the sound like great vitamins...and Edward s looking all fit and trim!! We will definitely check out these supplements! Edward...you are looking FAB! LOL! Great review, and you sure are sexier than ever! Thanks for letting us know. We need all the support we can get.